Dit artikel kan je misschien helpen met ideeën voor ecologisch verantwoorde projecten, recycle manieren, milieuvriendelijke activiteiten en welke organisatie je daarbij kunnen helpen. Misschien werk je voor een duikschool of accommodatie of ben je manager of eigenaar van een duikschool of ander toeristisch product. Maar ook als je zelf een reiziger bent die graag meehelpt met het behoud en de bescherming van het milieu en de oceanen door het gebruik van plastic en afval te reduceren of hergebruik te stimuleren, ongeacht waar je ter wereld bent. Op de Phi Phi eilanden in de Andaman Zee in Thailand lopen enkele interessante projecten die overal toepasbaar zijn en je kunt er in dit artikel meer over lezen. Bij aankomst op de Phi Phi Eilanden was ik eerlijk gezegd een beetje in shock toen ik een vrolijk schijnenden gele ´M´ zag, zodra ik de jetty verliet. Ja, de Mc. Donalds is daar en het is één van de eerste dingen die je zit wanneer je op het eiland arriveert. Het eerste wat in me opkwam was de hoeveelheid afval die de Mc Donalds hier produceert. Plastic, en ander afval, is een groot probleem op de eilanden in de Andaman Zee, maar vooral op de kleinere eilanden waar veel reizigers komen zoals de Koh Phi Phi eilanden en het eiland Koh Lipe. Zoals bij andere dingen in het leven, is het beter niet te blijven focussen op de negatieve dingen en zodra ik met mijn gedachtes verzette, zag ik ineens verschillende gele t-shirts (grappig, in dezelfde kleur!) van Trash Hero. Ook duurde het niet lang voordat ik bij Blue View Divers uitkwam en met hen enkele duiken deed. Je kunt in dit artikel meer lezen over het duiken op Koh Phi Phi. 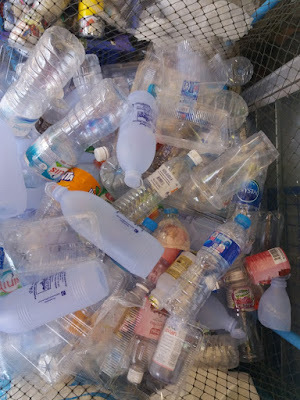 Ik raakte zo enthousiast over alle milieubewuste en recycle projecten dat ik besloot er een volledige blogpost aan te besteden. Caroline van Blue View Divers nam de tijd om me alles te vertellen over wat ze doen met betrekking tot het schoonhouden en beschermen van het milieu op de Phi Phi eilanden. Trash Hero is een globale organisatie met projecten in lokale communities over de hele wereld. Hun missie om het bestaande afval op een duurzame manier te reduceren en de totstandkoming van meer vuilnis in de toekomst terug te brengen. Met hun acties van het oppikken van elk afval, educatie en inspiratie in lokale gemeenschappen, maken ze echt een groot verschil. Als je door Thailand hebt gereisd, heb je vast de roestvrij stalen waterflessen gezien die reizigers kunnen kopen en gratis kunnen worden gevuld met drinkwater op bepaalde plekken. Dát doet Trash Hero. Ze zijn vele verschillende projecten begonnen en helpen gemeenschappen over de hele wereld. Je kunt hier meer lezen: https://trashhero.org/ Toen ik ging duiken met Blue View Divers, kwam ik erachter dat ze een groot aantal milieuvriendelijke en plastic reducerende projecten van Trash Hero sponsoren. 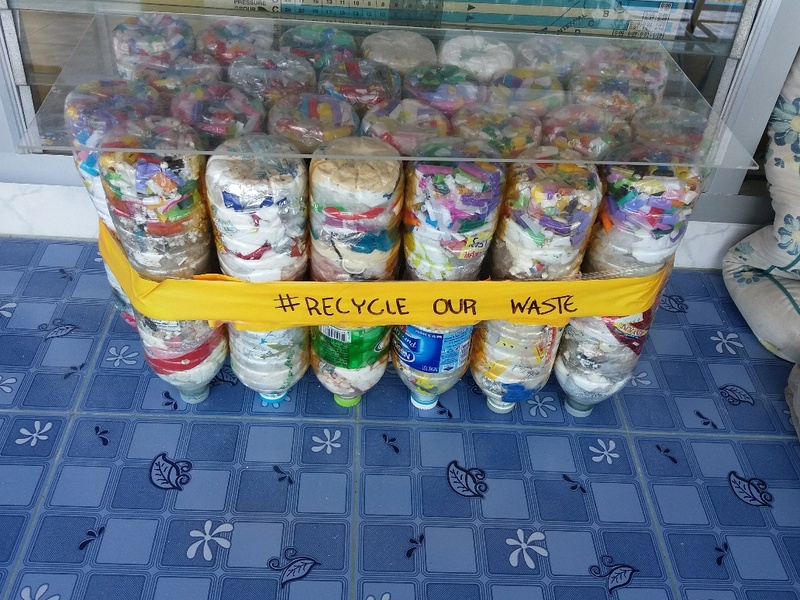 As soon as I walked in the dive center to organise some scuba diving on the Phi Phi Islands, my eye caught attention of a big recycling project outside the dive school. After chatting to the super friendly co-owner of the place, Caroline, I realised how many people are working on keeping Phi Phi clean. I will give you a taste of all the projects Blue View Divers is involved with, however there are many other organisations and people involved and some of these projects are not initiated by Blue View but I just got the privilege that Caroline from this dive center took the time and showed me her willingness to explain me all about it. It´s also how I found out that a variety of organisations is working together on this goal and have assigned different tasks between them. 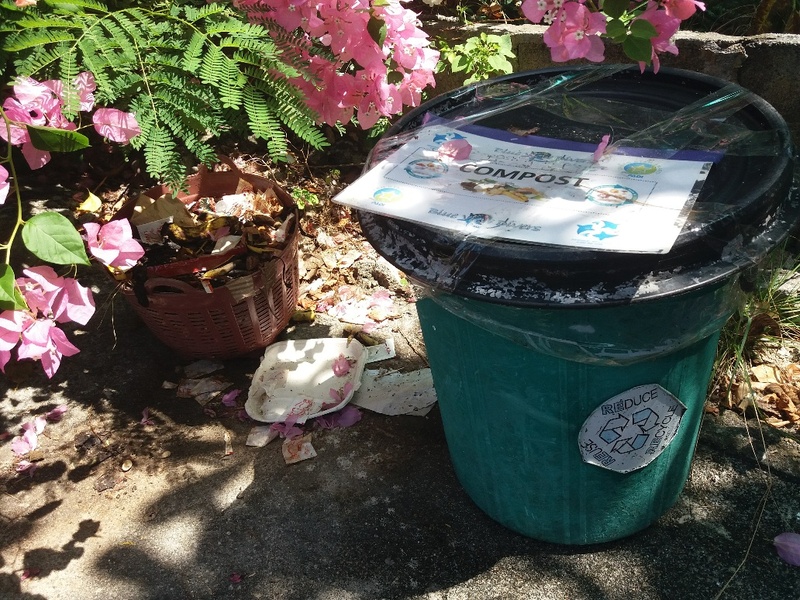 Every 10th and 20th of each month an island cleaning is organised to keep Phi Phi clean. This is organised by the Conservation and Protection Team of the Phi Phi Islands. The Phi Phi tourist business association has a responsive member for each business type (i.e. 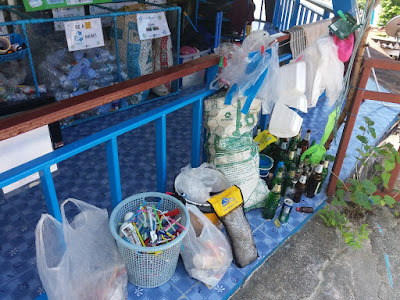 dive centre, hostel, tattoo shop, restaurant) in order to help and be involved with the projects to keep Phi Phi clean and sustainable. Also many local Thai people are very willing to help cleaning during these clean ups and you will see them collecting waste as well. 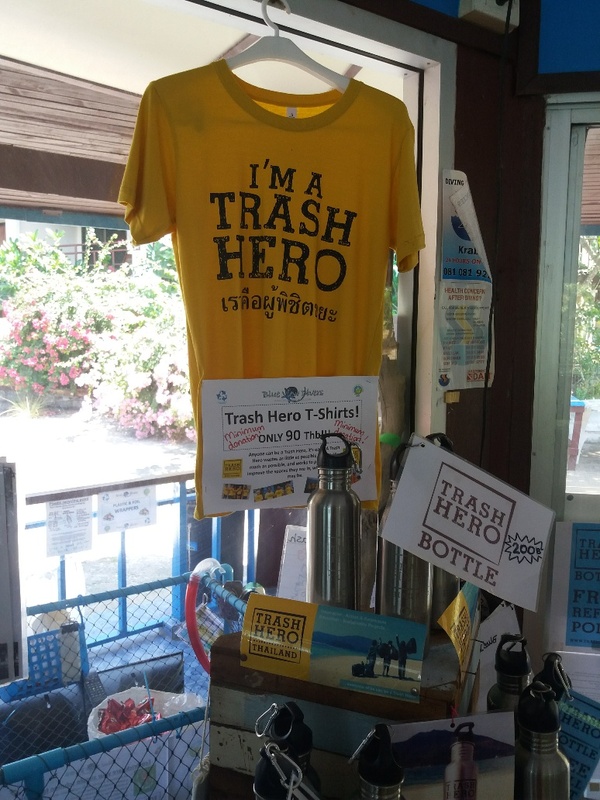 Because the island cleaning is already organised by the Phi Phi Conservation and Protection Team, Trash Hero only supports the island cleaning and will send anyone who wants to help to the organisation named above. 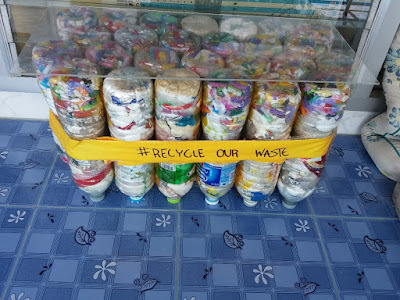 On Phi Phi however, Trash Hero is focussing on another great project: the eco-bricks! 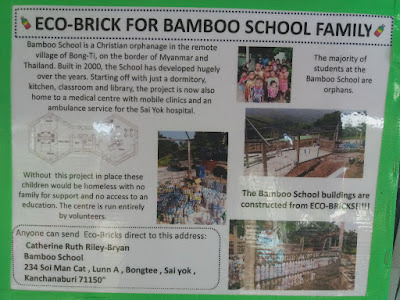 I already told you a bit about this in another article about scuba diving on Phi Phi but here I will explain you what an eco-brick actually is and where it can be used for. Building a school with plastic eco-bricks! An eco-brick stand up paddle board! Another project Trash Hero hosts is to build a stand up paddle board from eco-bricks. To create more awareness of the plastic pollution problem, they are going to paddle with it through the Thames in London, coming summer. One of the instructors working for Blue View Divers, Nataly, told me full enthusiasm all about this project. She said that she´s helping a lot in all the projects whenever she has the time for it, besides teaching scuba diving. 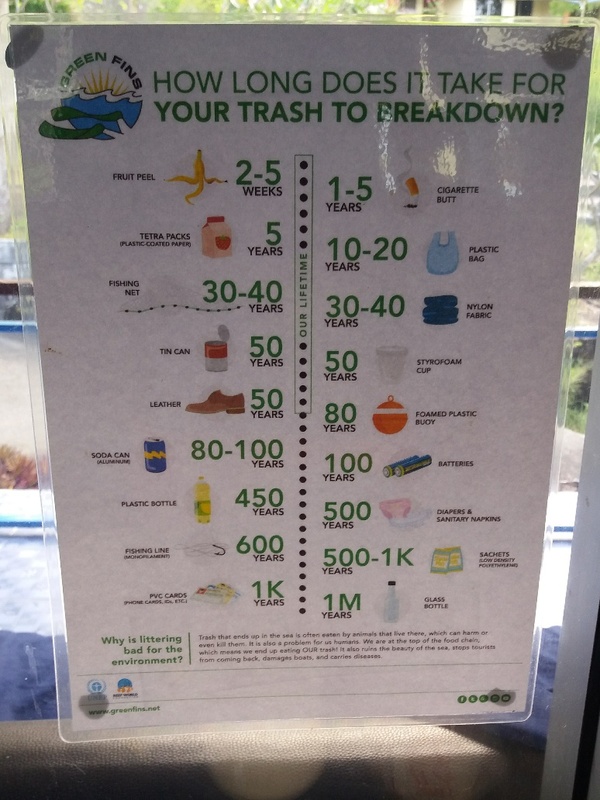 Other then helping Trash Hero by collecting waste and plastic bottles for the above projects and the non-profit selling of ´Trash Hero´ t-shirts and stainless steel water bottles which can be refilled for free, Blue View Divers does even more. After returning from scuba diving they collect all waste seen on the island and bring it to their recylcing station. Straws are counted and written down on a board to make people aware of it and they sell reusbale bamboo straws. Broken flip flops are sent to a Thai company which makes new ones out of them. Biodegradable waste goes into a composter and the compost is given to local Thai people, later on. 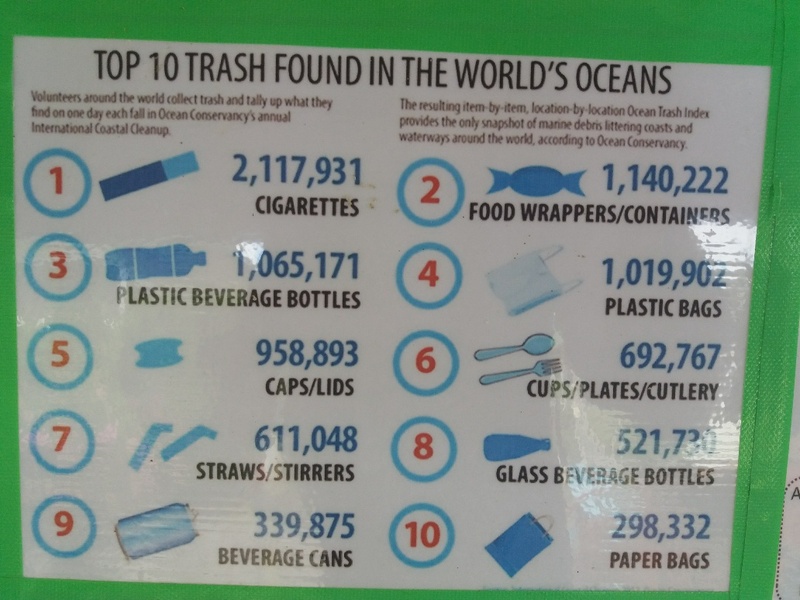 Almost every kind of trash gets used again or they make it usable, even cans are transformed into ashtrays and ring pull tabs are collected for a project to make prosthetic limbs. An elephant who lost her leg got a prosthetic limb because of this project by ´Roots & Shoots´! At the dive center of Blue View Divers you can see tables and other stuff made from the eco-bricks and a bean bag filled with straws (which is very comfortable to sit on by the way), to name a few examples. They also help to reduce waste by using recyclable lunchboxes and by providing them to their guests who are getting food to take away. They even stimulate the travellers to use one of the Trash Hero stainless steel bottles if going for a fruit shake, which unfortunately in most case is still served in plastic throw-away cups in Thailand. 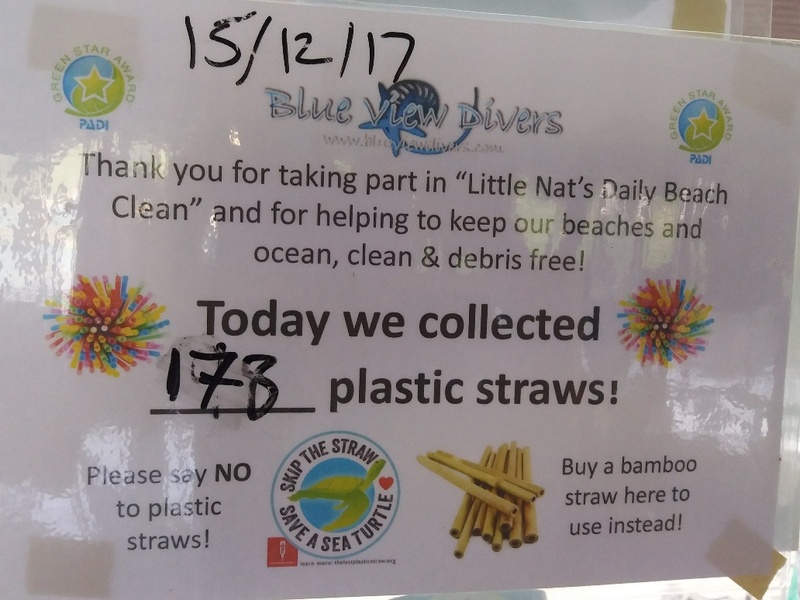 Blue View Divers diving center has a list of eco-awards and projects they are involved in or working with on their website. I was suprised, however, that I didn´t see much more dive centers like this on the Phi Phi Islands. I think Blue View makes a huge difference upon the environment and could be a true example for other dive centers anywhere in the world. Green Fins Thailand is coming every year to check if they still meet their values and required standards and the dive centre is also awarded by PADI with a Green Star Award, as the only one on Phi Phi. 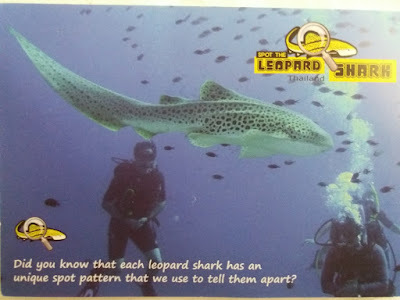 The dive centre is also a Shark Guardian Centre to raise awareness about the protection of sharks. As I already expected and as the co-owner of the dive center, Caroline, confirmed, all these projects take a lot of time. A dive center is already a busy operation so sometimes it´s hard for them to keep up with all the projects, but the whole team is working very hard to help. They might get a volunteer to work for them to help just on these projects, stay up-to-date with them through their website or Facebook page! 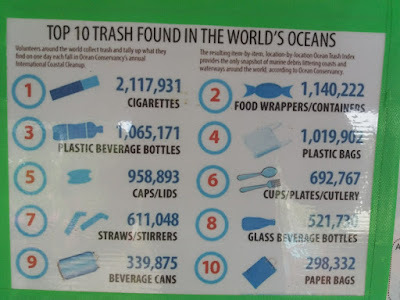 But not only the environment and amount of garbage is a problem. As a diving instructor myself, with experience working in variety of countries, I always wondered if there are no better ways to make local people more involved in diving. 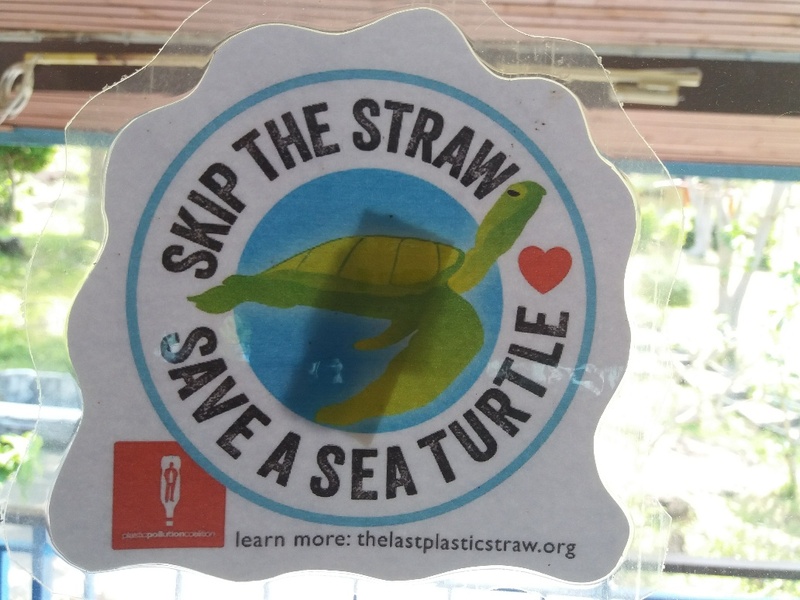 In places like the Philippines, but anywhere in the world really, it could help locals getting a better income and make them more conscious about the sea. I only name the Philippines here because during my stay on Malapascua Island in 2012, I was in shock to hear local people doing dynamite fishing whilst scuba diving! And to be honest, we can´t blame them for it. They are just thinking about getting food for the day and wonder why the Western people pay so much money just to see fish! What a differences in the world, these people are on surviving mode whilst we pay money or leave our better-paid jobs to come and see the fish they want to eat. These local people probably don´t know that if corals get destroyed there soon will not be much fish left. In my opinion, getting them involved in scuba diving, would be thé solution to educate them, getting them to respect the oceans more and have a better salary so they don´t need to desperately blow up coral blocks as a way to find a dinner for the day. Blue View Divers is promoting local people to dive by offering free scuba diving to Thai locals. They have certified many local people to become divers even some of them up to working as dive professionals. Currently they have a Thai instructor working for them and another one taking courses and doing his advanced course at the moment. Ik hoop dat ik je met dit artikel heb kunnen helpen met duurzame en milieubewuste ideeën voor jou als reiziger, duiker of professionele medewerker in dit vak. 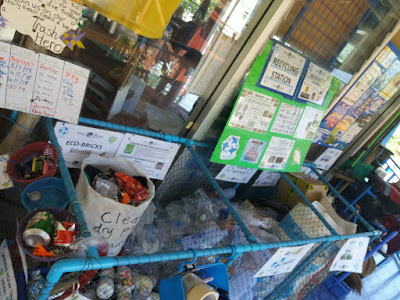 Het is niet nodig om een onwijs groot recycle station of alle deze nominaties te hebben om een verschil te maken. Ik denk dat het voorbeeld wat Blue View Divers geeft je kan helpen met maken van kleine veranderingen om te beginnen. Maar wie weet, misschien voel je erg goed over het helpen van jouw community en het milieu op deze manier, dat de duikschool waar jij werkt langzaam groeit tot eentje met een vergelijkbaar concept als Blue View Divers, ongeacht waar ter wereld je jezelf bevindt. Ik ben mezelf ervan bewust dat duikscholen drukke bedrijven zijn maar er zijn altijd manieren om samen te werken met andere organisaties of het aannemen van een vrijwilliger om je te helpen. Als we allemaal kleine stappen zetten, kunnen we een groot verschil maken voor de oceanen en onze onderwatervrienden. Plastic en afval is een erg groot probleem tegenwoordig, maar we zouden het kunnen zien als een uitdaging in plaats van een probleem. Graag bedank ik Blue View Divers voor het milieubewust en ecologisch verantwoord concept en voor het feit dat ze mensen bewuster maken. Ook bedank ik Caroline voor haar tijd en het mij voorzien van al deze informatie. Op dit moment ben ik bezig met het vertalen van verschillende artikelen die ik voorheen in het Engels geschreven heb. Ik ben begonnen met een serie of blogposts over hoe ik een instructor werd, en mijn ervaring van het werken in veel verschillende landen. Maar ik ben ook nog bezig met mijn serie over het eiland hoppen in de Andaman Zee met zowel informatieve artikelen als reisblog updates. Ook was het tijd voor mij om Thailand te verlaten, op het moment dat ik de Engelse versie van dit artikel schreef. Ik heb geweldige nieuwe reisplannen op mijn agenda staan. Ik ga mijn ex-collega´s op het eiland Veligandu in de Malediven opzoeken. Hier heb ik als duikinstructrice gewerkt in 2010! Ik ben super enthousiast om terug te gaan naar deze plek en dankbaar dat mogelijk is gemaakt voor mij om deze plek met haar geweldige duikplekken te bezoeken en Madivaru Corner weer te duiken! Ook zijn er nu hostels en guesthouses op het naastgelegen lokale eiland, Rasdhoo genaamd. Je kunt hier meer lezen over mijn ervaring met het reizen van de Malediven op een betaalbare manier met verblijf en duiken op een lokaal eiland. Op deze manier is het mogelijk om deze wereldklas duikestekken te duiken voor mensen met een lager budget en de lokale mensen te helpen. Ik zal binnenkort met meer informatie komen! Blijf op de hoogte en schrijf je in voor mijn mailinglijst in het roze gedeelte hieronder als je geen blogpost van me wilt missen. Veel leesplezier, happy bubbles en veilige reizen!